The government of British Columbia announced on July 25 that 15 percent of property transfer tax would be levied on foreigners buying Vancouver residential houses or condos as from Aug. 2. The house market in Greater Vancouver in west Canada is in chaos as an extra 15-percent tax on foreign buyers takes effect on Tuesday. [dropcap color=”#008040″ boxed=”yes” boxed_radius=”8px” class=”” id=””]T[/dropcap]he government of British Columbia announced on July 25 that 15 percent of property transfer tax would be levied on foreigners buying Vancouver residential houses or condos as from Aug. 2, causing chaos for more than 3,000 house or condo deals. It is still unknown how many deals have already collapsed, but Fraser Valley realtors in Greater Vancouver said foreign buyers are indeed backing out of agreements because of the tax. Soon after the new tax announcement, thousands of foreign homebuyers rushed to complete deals to avoid the new tax. “It is unfortunate that, in the wake of the most complex and volatile market we’ve seen, our government has chosen a path that, at this time, will bring significant distress to consumers both local and abroad rather than nuanced solutions,” Canadian Broadcasting Corp. news on Tuesday quoted Charles Wiebe, president of the Fraser Valley Real Estate Board, as saying. “The tax is unfair to the buyers whose deals are under way and wait for the process completion,” he told Xinhua. 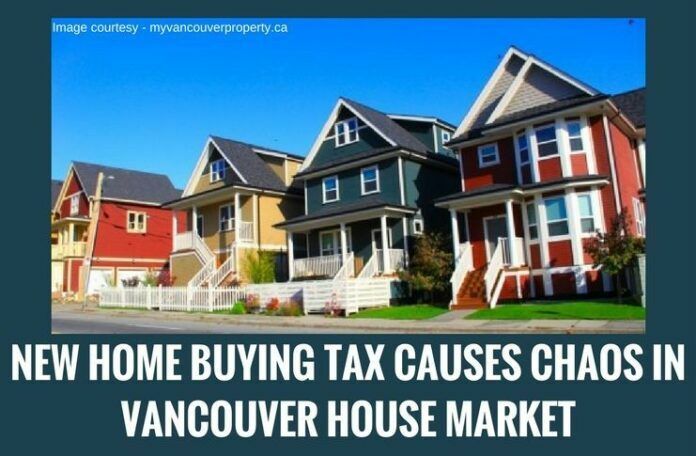 The extra tax on foreigners was aimed at cooling Vancouver’s surging housing market. Many believe the hot market was fanned by foreign buyers.